Everybody loves sudoku these days, and what better way to enjoy the game than to enhance through the use of an online sudoku player tool! We have created a fun interactive sudoku player, and the feed is now available for integration on other websites. Whether you run a small website or are a company that would like to include a sudoku feed puzzle on your site, we will have a sudoku feed solution that is right for you. The most popular feed is the puzzle a day sudoku feed, which automatically updates once a day and contains a range of difficulty levels of puzzles. For all corporate / business sudoku feeds we create, you will uniquely receive your very own feed of sudoku puzzles that are new and not supplied to any other site, giving you a feed that is not available anywhere else. The feed is effortless to integrate, and is a simple matter of copy and pasting the code. The colours of the puzzle are fully customisable and can be turned to match your site or corporate identity with just a few clicks. The difficulty of puzzles can be geared towards your individual needs as required. 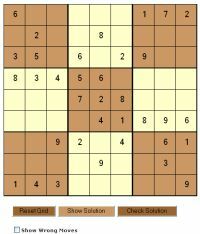 To see an example of the sudoku player in action on a website, simply view the Interactive Sudoku Player Feed in operation. As you'll see, not only will you get the sudoku puzzles but also the use of the player on your site for the duration of your subscription to the feed. There are a large range of options available. These include selecting from a fixed or varied selection of difficulty levels (easy, medium, hard), sizing the sudoku puzzles, setting the colours, having feeds that update daily, weekly or monthly, or on some other time period to suit your requirements. We have solutions available for any budget and size of site, from personal websites to large corporates. For individuals looking to include the sudoku feed on their personal site, please send us your site details to receive the code for a free sudoku feed with advertising. If you are interested in the provision of a tailored and exclusive sudoku feed for your company's website, please do Contact Us with the name of your website and let us know the type of feed you are interested in.